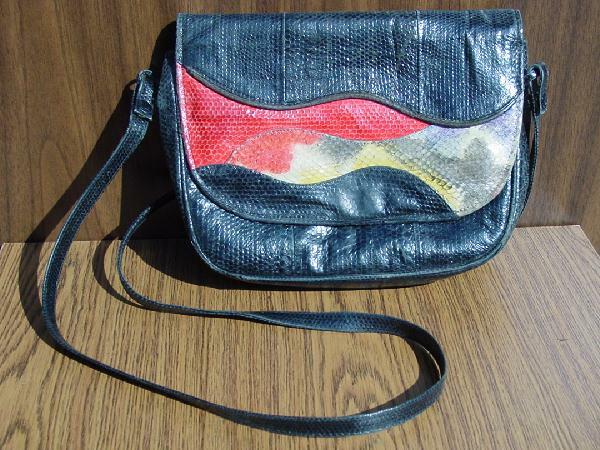 This vintage black reptile purse has a wave of mustard, gray, and red snakeskin on the front. The interior is black suede and there are 2 inner pockets, one open and one with a zip closure and a padded fabric lining. It was styled by Lee Sands Hawaii and made in the Philippines. The 48" shoulder strap can be unsnapped and you can carry it as a clutch. There is a worn spot (not as shiny) on the outside of the magnetic snap. There are some worn spots on the front bottom rim. It has the ever-popular "well-loved" look. It was used in several photo shoots for pictures for models' portfolios.